I flipped some pearl price tags recently; this was the price for button pearl earrings from a swank jeweler! They are a little petite for my taste and height (5'10") but they mention other lengths are available, so I'd order a 36-inch rope, for about $540– terrific value. Massed up, they'd glow madly. Their intense luster creates more drama and presence relative to size, just as a beautifully-cut smaller diamond eclipses a larger, just okay stone. You could wear them as is, and when it's time for restringing, take them to a designer for restyling, adding other elements or an interesting clasp. 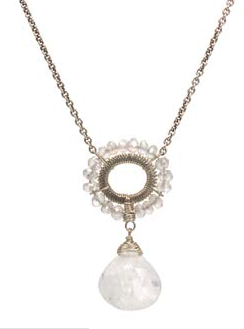 Or– though strictly speaking, you are not supposed to touch pearls with anything but another pearl– you might layer the pearls with a pendant, chain or another necklace, such as this Dana Kellin rainbow moonstone and milky quartz piece $194 from Twist. 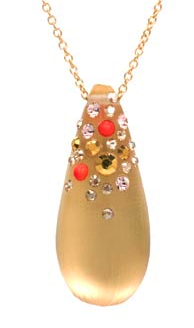 I'd pair the p each-toned pearls with this Alexis Bittar gold Montauk pendant, $155 from Twist. At this price, these exotics offer great glow for the dough. Or delight a June birthday (pearl is their birth gem)! The 90-day complete refund policy removes any lingering qualms. As if I have qualms about pearls! The shimmer is + and the price is+ and the return policy=unbelievable! Women should jump on this offer. Wearing something great near your face at this certain age is s o important. And if you want to wear pearls, they must be real. I allow myself a funky necklace too, but then it doesn´t pretend to be anything else. I have not tried the pendant mix, probably won´t, but it is something worth trying. I know there are small charms, which can be added to a pearl necklace if you wish. Very tempting! I've been occasionally hanging a pendant from my pearls -- I try to position it so it's not rubbing against them directly although I know there's a bit of a risk -- I think it's worth it for the fun of changing up the look a bit -- what do you think? metscan: There are some fun faux pearls but at these prices, real is in reach. materfamilias: I see you in one of the peach tones. I don't hang pendants, wear a chain with mine (bad girl!) or a fine chain with an antique pendant. But these pearls are so reasonable- you could just wear them any way you pleased. Abraded pearls can be 'peeled' (actually polished) if the nacre is thick enough; this must be done by an experienced jeweler. I don't think I realized that one shouldn't wear the pendant with the pearls, although I haven't done it. These are really pretty and a fabulous price. They are gorgeous, too classic for me in that form, I'd have to have them restrung into something more creative. These are beautiful, but I just purchased a strand from Kojima Pearls that Sarah restrung into a necklace and bracelet for me. I can hardly wait for them to arrive. They are large mixed color ovals, quite different from anything I have. Thanks, Duchesse, for recommending this company. Sarah was wonderful to work with. That teardrop pearl is absolutely gorgeous! I'm 5'10 also, so I know we have to be careful with "ditsy" but masses of ditsy always equal major statement which I think works nicely for us, non? Patty: That's not pearl, it's lucite , the material that Alex Bittar has made his signature. The shimmery quality of this particular lucite does make it resemble a golden pearl and it would compliment pearls. Also, if it were pearl, and that size, whoa, the price would be way higher. Tish: The layer of nacre can be scratched by metal or even other pearls is there is sufficient friction. Some pearls are strung with (for example) gold spacers. That only will affect the pearl where is is touched, but if you ever unstrung the pearls and took the spacer out, you would see the abrasion. Because the nacre layer can be extremely thin on today's pearls, even another pearl can scratch so if you have pearl studs, they should be stored separately, or wrapped separately for travel. The pearl itself is pretty tough- you can step on a pearl, but it can be scratched. With inexpensive CFWPs you are likely not as worried but with very costly pearls, scratching is something to avoid, as finding a perfect match for in strand is difficult. 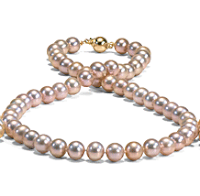 Pearls can be resurfaced IF the nacre is thick enough but it is a delicate operation, to be done by a pearl specialist. French women like to wear chains with their pearls- so do I- but it is as risky as wearing chain next to fine enameled pieces. Sewing Librarian: Would I love to see those! Sarah is terrific to work with- enjoy! Imogen: Good idea, and AUS has so many talented pearl designers. Who is this fantastic Sarah of whom you write? (www.kojimapearl.com); Sarah is the owner. In the future, if you choose the anonymous option, I request that you please sign your posts.